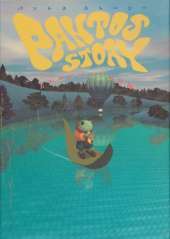 This is a CD-Rom of interactive picture books depicting the frog's "Pantos" traveling on a balloon and it's the sequel to Putlestory (ピュートルストーリー). Pantos is a small frog living in a small pond. One day, it receives a parcel of fate from a musician named "Rashiel" who lives in the body of Garcia to study the ecology of the giant fish "Garcia" flying over the "ocean of forget" that should not exist in this world. In order to meet Rashiel, Pantos travels on a balloon to the "ocean of forget". The end of the daydreaming world that evokes fear and longing is a different space where silence and heterogeneity interweave. Residents of Wonderland show you the way you are going.